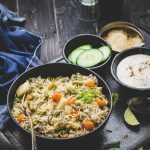 Step by Step instructions on how to make Vegetable Pulao Rice in the Instant Pot. This recipe can be made in a pressure cooker / open pot too. Wash the rice under running tap water at least 6 times and soak it for 30 minutes. In the meanwhile, chop the vegetables and set them aside. After 30 minutes, drain the water from the rice into another pan and use it for cooking. Remember to place the Inner Pot inside the Instant Pot. Put instant pot on sauté mode high. When the screen displays HOT, add ghee/ oil. Once heated, add the whole spices on the table and saute for a minute. Add ginger, sliced onion and 1/2 Tsp of Salt and saute for another 3 minutes until onions turn translucent. Add the soaked rice and saute for another 3-4 minutes until slightly roasted. Add the rest of the vegetables, garam masala, chilli powder and salt to the rice and stir to combine. Switch off the sauté mode and add 2 1/2 Cups of Water. Select the manual (or pressure cook) setting, make sure the pressure is set to high and set the timer to 5 mins. It takes approximately 7 minutes+ for the IP to kick in. Cook till done. Once the timer beeps after 5 minutes, do the Quick Pressure release. Just as the Safety Pin drops, open the pot and allow the Vegetable Pulav to sit undisturbed for 5 minutes. Fluff the Rice with a fork. Check for seasoning and add more salt if needed. Enjoy your Vegetable Pulav Rice with Raita / Curry of your choice. Soon after you saute the vegetable in your cooker pan, pressure cook the Rice for 2 whistles and turn it off. Allow the steam to release naturally. Fluff up the rice with a fork and serve them hot. Quantity of water totally depends on how much it takes to cover the rice. Ensure the water should be just over the rice. Usually when I cook open top, I would use 2: 1 proportion for water: rice. Since we are pressure cooking, I have used slightly less.